This is Nong Khai's most famous (and bizarre ) attraction. 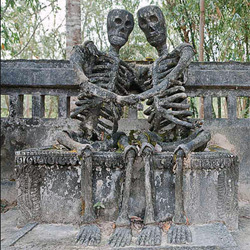 Located 6 kilometers outside town the park is home to huge sculputures crafted by the mystic Luang Pu Bunleua Sulilat. The sculptures (some over 20 meters high) reflect both Hindu and Buddhist ideologies. Probably the most well known artwork is the Wheel of Life reflecting the cycle of life. Entrance is via a womb shaped tunnel followed by various statues depicting the mystic's view of the stages of life. During August the parks acacia trees are in full bloom with fragrant yellow blossoms. Located near to the Mekong River and covering more than seven winding streets the market has the feel of a Middle Eastern sook. Goods on sale in this daytime market include fabrics, clothes, ornaments, furniture and electronics, not only from Thailand but also Laos, Vietnam, China and even Russia. The Buddha Image at Wat Po Chai is especially interesting. It is one of three Buddha images cast for three daughters of famous King Setthathirath of Laos. The daughters were named Serm, Suk and Sai and thus the images are known as Phra Serm, Phra Suk and Phra Sai. Following wars between Thailand and Laos 1827-28 the three images were taken from Vientiane by the victorious Thais for eventual transportation to Bangkok. During a storm Phra Suk fell into the river never to be recovered. Phra Serm was successfully removed to Bangkok, but on each attempt to transport Phra Sai to the Thai Capital, some problem ensued and eventually it was decided to leave the image in Nong Khai. The Nong Khai Freshwater Aquarium is located on the Khon Kaen University campus, about 4km out of town. It is famous for its giant catfish and displays both ocean-dwelling species as well as freshwater fish. The aquarium is a great place to visit and relax, with a picnic garden area and drink stalls. The aquarium holds scuba-diving shows at the weekend. 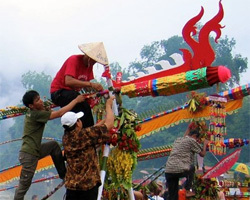 The rocket festivals of Nong Khai normally occur in May, which is the sixth lunar month, in June, and sometimes July. Every year at these times, large rockets are fired into the sky and the crowds gather to watch this event as well as enjoy the music, stalls, and vibrant atmosphere of the festival. Visakha Puja day, which is the day that Buddha was born, the day of his enlightenment, and the day of his death, marks the beginning of the rocket festivals and a parade takes place in celebration.